The episode begins right before holiday break. It's definitely a 90's conception of the "holiday," too, complete with pine trees, green and red decorations, multicolored lights, and an near endless number of Christmas tunes with new recycling-themed lyrics. I don't think they said the word, "Christmas" once, though they did mention Hanukkah several times. My favorite shot in the special is one of a chalkboard with a picture of a menorah and other Hanukkah paraphernalia surrounded by a Christmas garland. They tried so hard to be inoffensive and yet, failed so miserably. Wanda, a particularly self-obsessed kid, is trying to rush her classmates through recycling so she can make it to a performance of The Nutcracker. Her admission is a nutcracker toy, to be donated to charity. 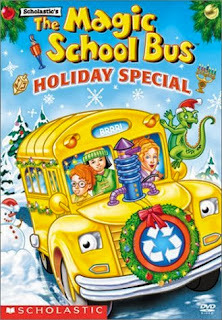 This leads to the introduction of Murph, Ms. Frizzle's cousin, who runs a recycling plant and is voiced by Dolly Parton. Wanda's best friend, Arnold, accidentally recycles her nutcracker, which naturally leads to a spin on the classic Christmas story, It's a Wonderful Life. Instead of continuing with the Nutcracker parallels, Wanda remarks she wishes that recycling was never invented, so Ms. Frizzle decides to operate the decyle-inator (they didn't call it that, but they should have) and show Wanda what the world would actually be like without the practice. Recycling is important. However, if there were no recycling, it's unlikely every tree in the world would have been cut down or their school would be buried under a literal mountain of trash. This portrayal of recycling as a clean, fun, quick way to transform old things into new ones is a gross over-simplification. I'm glad they're trying to get kids to accept the idea, but the image of a busload of kids hanging out in a factory where piles of post-consumer plastic are being melted down is a bit absurd. Shouldn't they at least be wearing masks to reduce the toxins they're inhaling? At any rate, the decyle-inator accidentally shoots their bus, which reduces it to the frame and piles of plastic jugs, glass bottles, and aluminum cans. Fortunately, they're able to recycle these back into their bus. Now armed with a new found appreciation for recycling, Wanda asks if they can recycle more junk into a new toy soldier. They make dozens, for some reason, so now all of the kids can go see The Nutcracker. Only there's another twist coming. Arnold's grandmother is sick, so he has to take a train to visit her for Channukah. He leaves, and the other kids feel bad. Naturally, Ms. Frizzle immediately uses the time-travelling capabilities of the Magic School Bus to ensure Arnold can see his grandmother and the kids can all still make it to The Nutcracker. Then she brings about world peace, cures all major diseases, and goes back in time to kill Hitler. Okay. That's what she SHOULD have done. Instead, the kids skip the ballet and visit Arnold on the train, where they sing a parody of the Dreidel Song with the lyrics changed to be about recycling. This is precisely why you shouldn't hand infinitely powerful artifacts over to aging hippies.